Mekele is situated on the bottom of hills, and was founded by Emperor Yohannes IV as his capital when he relocated his power base from Debra Berhane to Mekele in 1881. 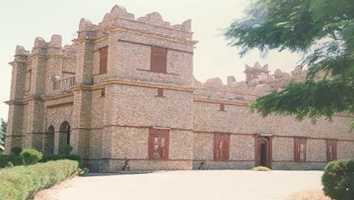 Yohnnes built a number of churches including the churches of Saint Teklehaimanot, Medhane Alem and Kidane Mihret during the 1870s and a palace, which is now a museum, in the 1880s. Mekele is a useful base from which to visit the rock-hewn churches around Tigray such as the Churches of "Abraha wa Atsebah" in Wukro. Mekele is an important city for the Tigrayan economy. It is the terminus of the salt caravan route from the Danakil Depression (Danakil Desert), where the slabs of salt are mined in the Arho region and transported by camel back caravans to Mekele. Salt merchants come to Mekele market from all over the country. Arho is the hottest region in the country and the temperature climbs up to 50 degree Celsius. The journey from Mekele to Arho, the salt mine area, is very tough and many people and camels die on route. It takes between one to two weeks to make the journey. Fekadu Bekele, Ethiopian National Metrological Services Agency, http://ccb.colorado.edu/ijas/ijasno2/bekele.html, Addis Ababa, Ethiopia.